There was a time when my home server was a large computer with RAID drives and loud fans that stayed on 24/7. Gladly that time is no longer, and I’ve moved to a more power-friendly netbook-based thing which generates hardly any heat and can therefore be left in a small cupboard without airflow concerns. The disk performance is, naturally, horrific, but it serves files up fast enough for me to stream music around the house. I now do pretty much all my photo editing work on my laptop, which I take around with me. As I still have the requirement for archiving large volumes of data to the desktop PC with hardware mirrored drives, unfortunately this machine has to stay. But I can keep it turned-off for 95% of the time, and only turn it on to copy / archive my data to it when needed. As well as saving energy, this should increase the lifespan of my disks by a long way too. My netbook also acts as a web server from which I am hosting a simple ASP.net application to send WOL (wake on LAN) magic packets to my desktop PC. This is secured using Basic Authentication over SSL. It is therefore now possible for me to securely start my computer up when I’m away from home, then log on remotely using RDP (or establish a VPN connection). However – this is unrelated to my post. I tend to do the large file transfers when at home, and given the regularity of these transfers, I’ve set up a directory on my main laptop into which I can dump everything ready for transferring, then run a robocopy batch file to move this data across. Cue: “Amazing Robocopy“. (This is a super batch file which runs the robocopy routine and does a load more. I may have wasted an entire evening writing this batch file.) Hopefully the above gives you the context you need to fully appreciate why I need such a thing. 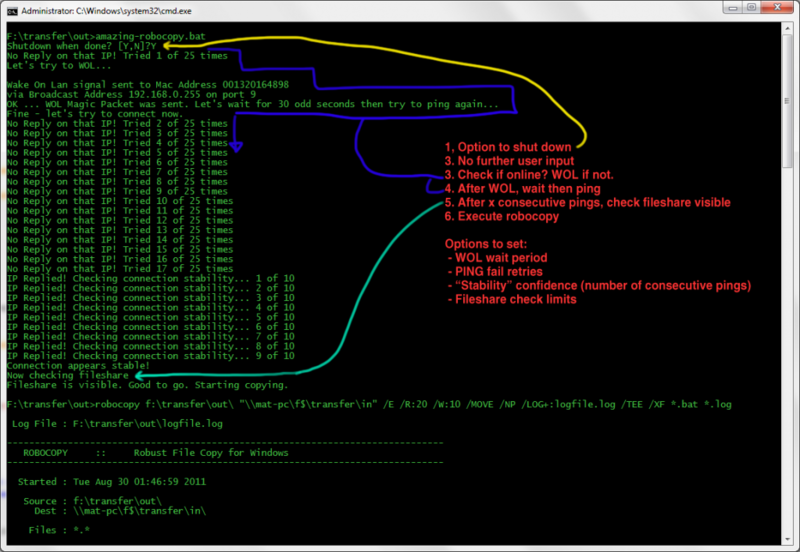 Run the robocopy and log to a file. Amazing Robocopy goes something like this. It may be best to paste this into notepad before attempting to read. Notes: download Depicus Wake On LAN for command line, and put it somewhere in your PATH. You’ll need to set the WOL arguments manually, as they can’t be configured with variables. Also you’ll need to set the robocopy parameters to suit you. : - test connectivity to the machine (ping). Send WOL Magic Packet if it doesn't respond. : We'll strip quotes from the outsides of these, so feel free to use quotes around each varilable - or not. : If, after sending wol and waiting, there's still no response, we'll wait 1 second and try again. : This is the total number of tries. TBH, may as well set this really high and Ctrl-C if you get bored. : What do you consider is a good number of ping receipts to get back before deeming your connection to remote machine is stable? 1 = impatient. 10000 = paranoid. 10 = normal. : Frankly, if it isn't, it probably won't become available. And you'll have to figure out the problem separately. : But this gives us the option to keep trying x number of times before continuing. : Note: this number doesn't correspond to an amount of time. Windows is unpredictable when trying to check fileshares. CHOICE /M "Shutdown when done? @echo Fine - let's try to connect now. @echo We didn't get very far did we? @echo I sent a WOL, waited, but nothing! @echo Increase the pingfaillimit variable? @echo Fileshare is visible. Good to go. Starting copying. @echo Couldn't find fileshare - tried %filesharetestcount% of %filesharefaillimit% times. @echo Failed to find the fileshare. Oh no! @echo Maybe verify the fileshare is accessible yourself? This entry was posted on Tuesday, August 30th, 2011 at 3:21 am	and is filed under Tech. You can follow any comments to this entry through the RSS 2.0 feed. You can leave a comment, or trackback from your own site. Looks great this script, but unfortunately it isn’t working. I stripped out the WOL piece of code, because i don’t use WOL. 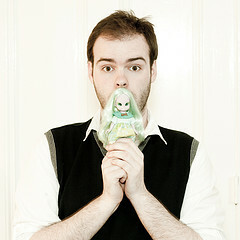 Mat is a London-based freelance photographer. This is his personal blog, and isn't related to his photography. My KeePass to LastPass Migration Woes! Home Automation PoE with Arduino - in praise of DIY PoE! © 2019. Mat's Hideout. Powered by WordPress. Cleanr theme by WPShoppe.